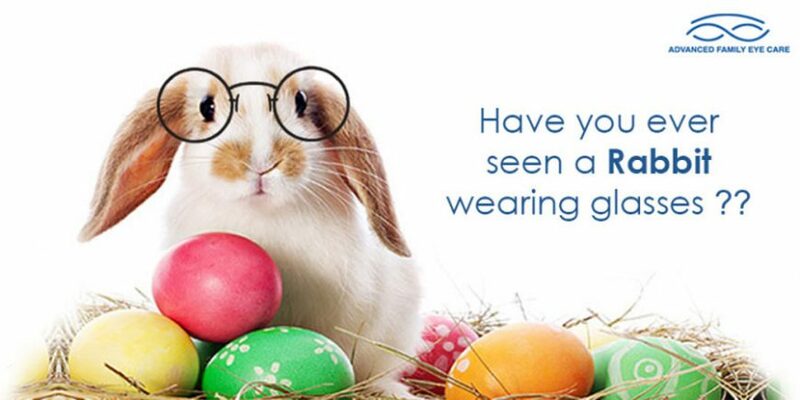 Springdale Eye Doctor: Have you ever seen a rabbit wearing glasses? Home » Uncategorized » Have you ever seen a rabbit wearing glasses? Have you ever seen a rabbit wearing glasses? Doubtful! We have always been told that eating carrots promotes good vision and healthy eyes, but is this truth or fiction? The orange hue of carrots appears because of beta-carotene, which is converted to Vitamin A in the liver, producing the richness that our bodies need to aid in smoothly functioning eyes. The truth is, rabbits don’t maintain their glasses-less faces on a diet of only carrots. There are other essential foods that help maintain healthy eyes. Leafy green vegetables are also important to the diet and eye health. Studies have proven that leafy greens actually help reduce the risk of cataracts and macular degeneration, the most common cause of vision loss in people 50 and older. While you are dying your Easter eggs, take the opportunity to crack one of those eggs open and enjoy the yellow yolk in the middle. Egg yolks are rich in antioxidants and zinc, which also reduce risks of macular degeneration. Citrus fruits and berries are known to contribute to healthy eyes. The vitamin C contained in these tropical fruits has been shown to reduce the chances of developing macular degeneration. A handful of almonds contains half of the body’s daily amount of vitamin E. These make for a convenient snack, all while helping slow the process of macular degeneration. Bright red and orange fatty fish such as tuna, mackerel, salmon, etc. are also contributors to an eye-healthy diet. These fish contain high levels of DHA, a fat found in the retina. Having low amounts of DHA has actually been linked to Dry Eye Syndrome, so a healthy amount of these fish can actually help alleviate some of that dry, uncomfortable irritation. So the next time you see the Easter bunny hopping through your yard, remember that it isn’t just carrots that keep his eyes in check.